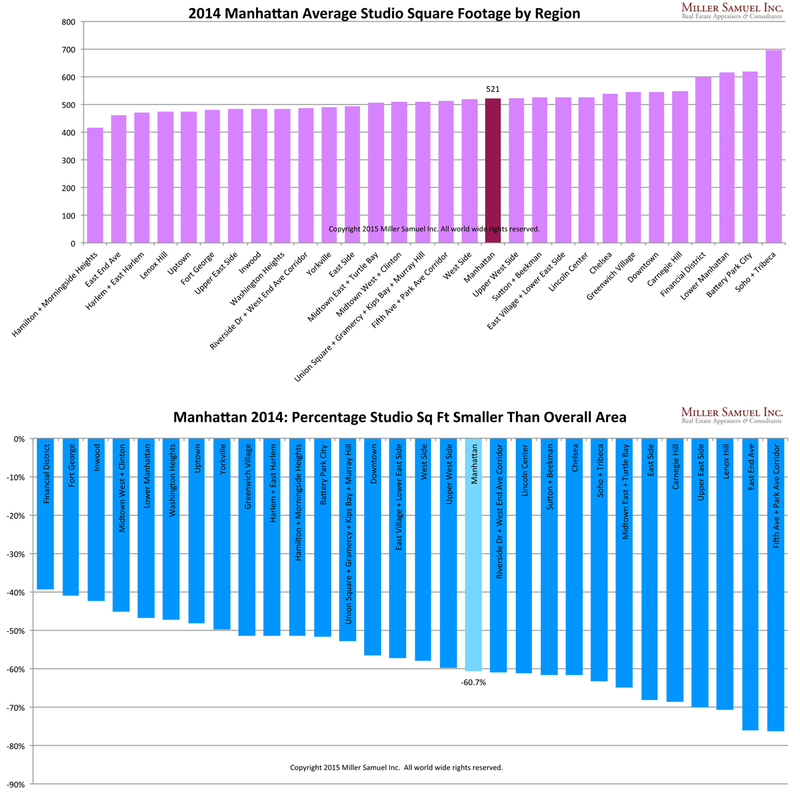 [Three Cents Worth #277 NY] Which Manhattan Neighborhood Has The Smallest Studios? Comments Off on [Three Cents Worth #277 NY] Which Manhattan Neighborhood Has The Smallest Studios? Today, when I speak to friends and relatives in other parts of country, I find a consistency in the image Manhattan currently conveys and it’s completely skewed. Here’s a little background. 1985 to 1995 [Wild West] I moved to Manhattan in 1985 and it was perceived by outsiders as a very dangerous place. 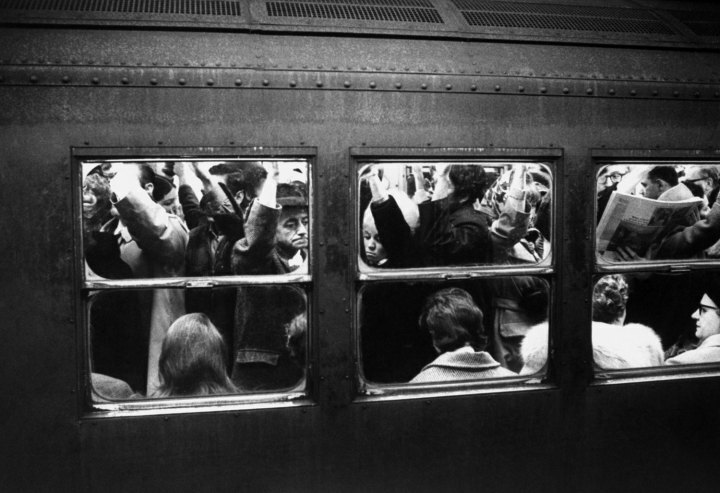 “Manhattan-bashing” was in vogue. My relatives in the Midwest saw Manhattan as a place where tourists were getting mugged and stabbed in broad daylight (It didn’t help that my father was mugged twice in Midtown outside of our office in broad daylight on a weekday). They feared for our lives. 1996 to 2000 [Dot Com Boom] Manhattan now had “Silicon Alley” as well as NASDAQ – which was soaring. Midwesterners were caught up in the stock market frenzy as evidence by conversations of trades of Microsoft and Caterpillar stock over potato salad and cheeseburgers and bottles of Faygo. 2001 to 2008 [9/11 to Development Boom to Lehman] The 9/11 tragedy struck New Yorkers hard but the subsequent rise of NYC from the ashes into an eventual new development housing boom was simply amazing. The Manhattan housing boom peaked in 2008, two years after the US housing market had peaked. This period ended with the collapse of Lehman Brothers and access to credit worldwide immediately evaporated. 2009 to 2010 [Collapse and Rebound] There was a surprisingly rapid improvement in the regional economy in the year following Lehman’s collapse and housing rebounded faster than expected. 2011 to 2014 [Playground of Wealthy Foreigners] Manhattan and Brooklyn become a favorite safe haven for international investors to park their money in real estate. 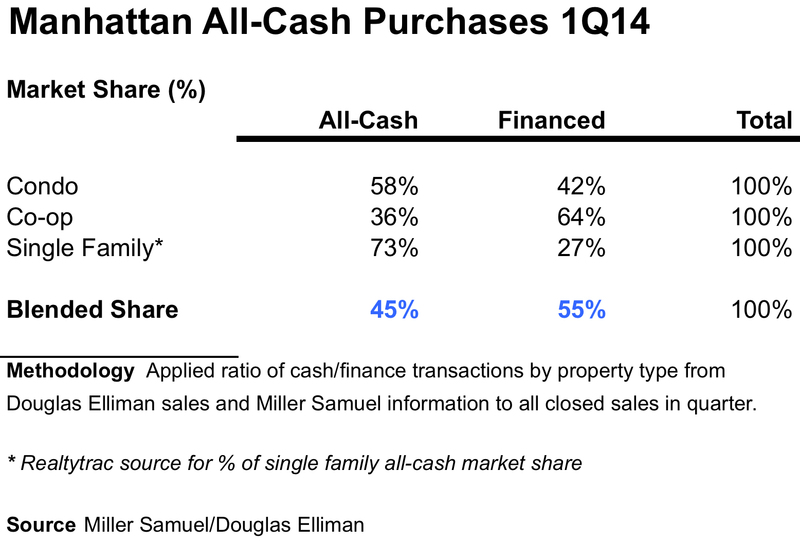 Most sales are all-cash transactions. Most purchasers are made by foreign buyers. Most sales are millions of dollars (i.e. $5M and up). 45% of sales are all-cash transactions. Foreign buyers are a small part of the market – i.e. 60% of all sales are co-ops and foreigners don’t purchase them. More than half of all sales are below $1M (i.e. $5M+ is way up in the top 5%). Coverage of my new book “Flash Appraisals” just passed Michael Lewis’ “Flash Boys” as “Most Read” on Bloomberg Worldwide. More importantly, Bloomberg News coverage of our recently released Manhattan market report for Douglas Elliman jumped into 4th place and passed the coverage of Michael Lewis’ new book (8th place) – I’m halfway through his book and it’s a fantastic read – so is Oshrat Carmiel’s article. The market report article has been the number 1 most emailed article all day. Apparently real estate remains the backyard bbq conversation not unlike rigged high speed trading on Wall Street. Now that the Oscars are behind us and the “next big snowstorm” just missed NYC, I thought I would finally talk about pizza. But because of why you are here – I’ll make price per inch and price per square foot interchangeable. 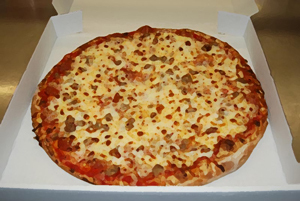 The math of why bigger pizzas are such a good deal is simple: A pizza is a circle, and the area of a circle increases with the square of the radius. 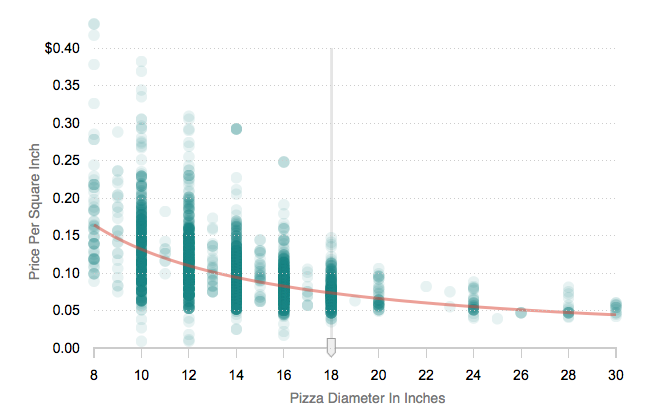 So, for example, a 16-inch pizza is actually four times as big as an 8-inch pizza. And when you look at thousands of pizza prices from around the U.S., you see that you almost always get a much, much better deal when you buy a bigger pizza. Explanation of above math: 200.1 inches of pizza surface versus 50.2 inches of pizza surface (pi*r squared=surface area of a circle) And here’s an easy way to calculate the volume of a pizza if you can’t help get enough pizza geometry. The premise of the piece is that it is much cheaper to buy a large pie than a small pie on a price per inch basis. Pricing for a large pie doesn’t expand as much as the surface area does so the price per inch drops precipitously. 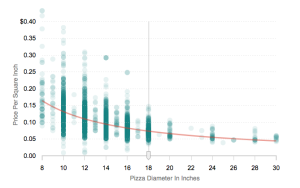 In the example above, the 16″ pizza wouldn’t be priced 4x as much as the 8″ pizza – probably more like 2x. Apparently pizza makers don’t take geometry seriously. Buy the large and throw the unused portion in the fridge. Perhaps that is why people buy homes somewhat larger than what they actually need – they will grow into it. In suburban real estate, after a certain point, larger the home is, generally the lower the price per square foot. There is a point of diminishing return on excess square footage. The total dollar price is higher, obviously, but the cost of additional space is usually less on a per square foot basis. Hence the pizza analogy applies. A well known example of diminishing return is the home featured in the documentary, Queen of Versailles. The 90,000 square foot home is so oversized for the Windmere, South Florida housing market that the vast majority of the living area likely has no value as a single family – other than to the current owners, of course. In a market with one of the highest per capita population density for a US city, there is a premium for larger contiguous space so perhaps that is why we have so many pizza joints. Here is an price per square foot table by apartment size – you can see how ppsf expands with apartment size consistently over the decade (actually it has shown this pattern for the past 25 years). It’s expensive to get more living area in Manhattan. 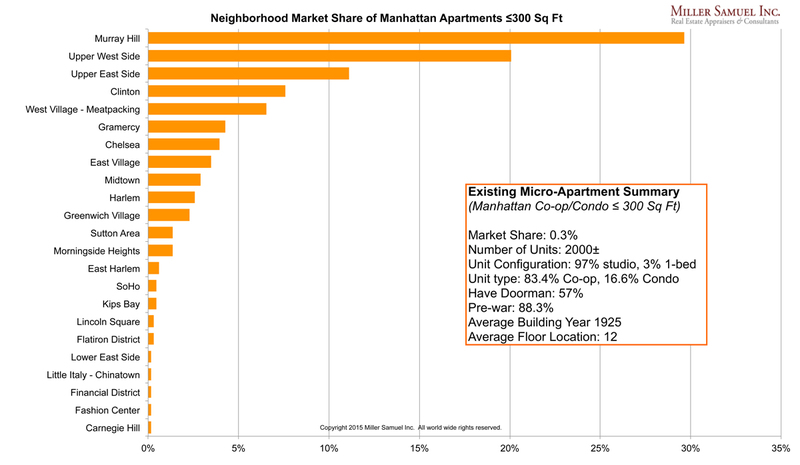 What I love about this chart is how Manhattan co-ops dominated the record books through the late 1990s Dot.com boom until condos started to take over. Until then, condos were seen as more utilitarian and less about luxury. 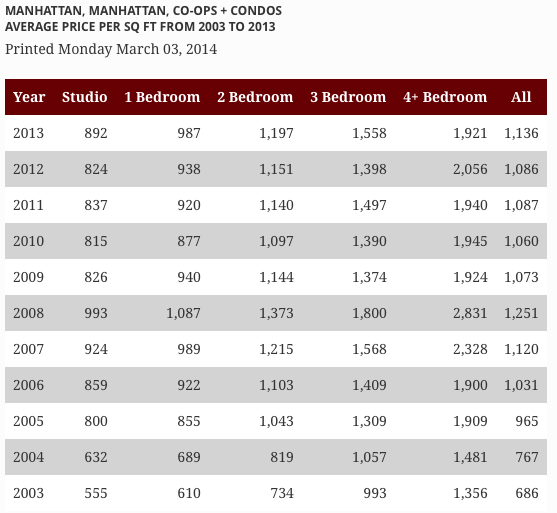 Over the past decade, Manhattan condos have generally eclipsed co-ops in the record books. As a stagnant form of Manhattan housing stock, they ain’t building luxury co-ops like that any more (actually they’re not building them anymore). I’ve updated this chart through the end of 2013, but it’ll be obsolete fairly quickly with records expected to fall in 2014. At a minimum, anticipated record closings include a few condos and a townhouse. The City Journal, a quarterly must-read urban affairs journal published a terrific article on the cycle of Washington’s efforts to encourage homeownership called Obsessive Housing Disorder by Steven Malanga. The author suggests our troubles began in the 1922 with Herbert Hoover’s Own Your Own Home Campaign and was seen in nearly all of the following decades. In December, the New York Times published a 5,100-word article charging that the Bush administration’s housing policies had “stoked” the foreclosure crisis—and thus the financial meltdown. By pushing for lax lending standards, encouraging government enterprises to make mortgages more available, and leaning on private lenders to come up with innovative ways to lend to ever more Americans—using “the mighty muscle of the federal government,” as the president himself put it—Bush had lured millions of people into bad mortgages that they ultimately couldn’t afford, the Times said. When I think back to our recent housing boom and the mantra of Fannie Mae and the former administration, we paid a significant price for a 5% boost in homeownership from 64% to 69% in a decade. The resulting economic damage render moot the effort – we got the ownership numbers boosted through artificial financial means. Although I tend to believe that owner occupied housing is better cared for by its occupants (speaking as a former renter), I had never considered the idea of history repeating itself in this economic sector, in such a specific way. Arizona, Florida, and Nevada have run through the riches of their boom and are starting to look more like cash-strapped New York.